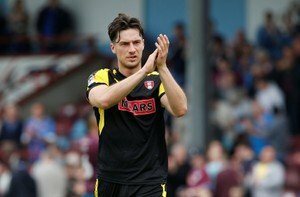 Vital Rotherham’s Player Of The Year has gone to Joe Newell for the second year in a running. Joe joined the Millers in 2015 from Peterborough on a three-year deal and has made one hundred and eighteen appearances scoring fifteen goals. This season his appearance tally was forty-five his eight goals all coming in the league. In April the twenty-five-year-old midfielder/winger signed an extension to his contract which keeps him at the New York Stadium until the summer of 2019. Joe was voted Vital Rotherham’s Man of the Match in our game away at Wimbledon in October, at home to Shrewsbury the following month, away against Bristol Rovers at the start of December, against Doncaster Rovers at home in February, in April away at Charlton and in the home win over Fleetwood and he was joint Man of the Match earlier this month at home to Blackpool. * We decided that having a vote for our game at Wembley was probably too difficult for us Millers fans – everyone deserved the award! Joe actually got thirty-one more votes than Moore in second place. Thanks to everyone who took part in our Man of the Match votes.